Ah yes, more ways to be betrayed, that's certainly what Crusader Kings 2 needs. 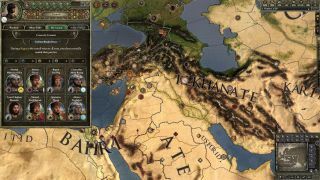 Conclave is the latest dastardly entry in Crusader Kings' stream of DLC, and it's out now, priced £11/$15. In Conclave, anyone who's anyone in your kingdom will now want a say in what's going on via your council. I know from experience that other people wanting things from you can only lead to madness, so you're welcome to ignore them. However, I also know from experience that disregarding political demands leads to ugly civil wars—PCG US keep muttering about 'freedom' and eyeing our teabags. You'll also be able to raise your children to be more conniving and entitled than ever before thanks to new education options, but don't be surprised if someone bumps them off at a wedding.